No One Else Can Find. With the right tools, hard jobs become easier. With our vast amount of granular, household level data, we can answer a lot of questions other data companies can't. Audience flow, true reach and frequency models, promotion effectiveness, creative impact, campaign saturation... we love partners with questions. If you want to know exactly how your campaigns or strategy are performing, this is the right place. We can ingest campaigns from up to three years past, match your media and brand targets, and create detailed analysis of the performance over time, with each campaign, and even each creative version. We'll Tell You What they Watch. Whether custom or syndicated, we provide valuable reporting that can identify what your target audience watches. Programs, channels, or dayparts, in any time increment, down to minutes and seconds. 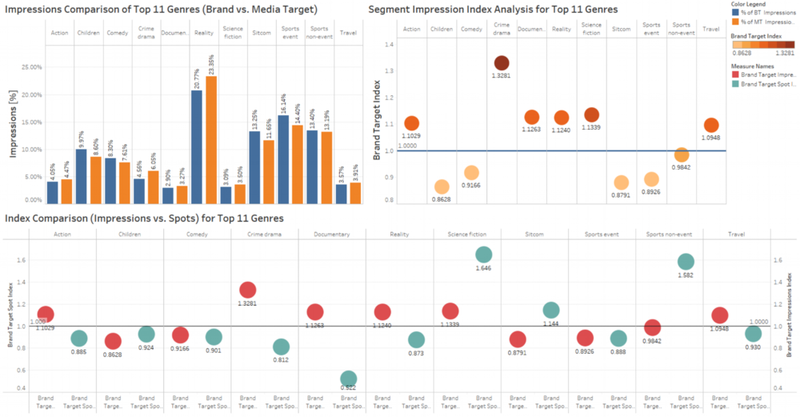 If you want insights into where to find your audience, or how program viewing trends over time, this is your solution. We can help align and define your targets, so if you want to speak to young Moms with children between 2 and 8 in the household, we can match and identify those homes, and of course, what they're watching. With our household level matching capabilities, we provide tools to do 1st and 3rd party data matches if you have customer data. Want to know what holders of your loyalty card watch on TV? Let's match them and find out. contact us to match your customers and create a custom TV audience. to get started creating a custom Tv audience, contact us. Break Down the Barrier Dividing TV and Digital. Modern marketers know that a single impression base for a customer or household is the future. We bring you one step closer to that future by identifying households based on defined criteria, such as frequency, ad exposure, or tune-ins, and then help you retarget those households either on your favorite digital platform, or on TV. Using our ingestion, matching and audience tools, we can analyze an ad campaign, determine households who have been exposed to an ad, and use our frictionless partnership with LiveRamp to expand them in a look-alike audience, so you can retarget on digital and mobile platforms. Imagine being able to place digital ads in front of households who saw your TV spot last night. We believe the old way of siloing media is over, and the intersection of audiences is here. to learn more about retargeting custom and syndicated segments, contact us. "Optimizing" a TV plan is not just buying more for less. Because we have vast amounts of matched, household level data, our own MD DMP and Reveal Analytics Platform, we can help plan, measure, do post-run analysis, and yes, "optimize" your TV campaign. We begin with audience and translate your brand target into a TV target, understand your buy parameters, your optimal reach and frequency, your retargeting plans, and lastly, your budget goals for your campaign. Then we help plan the best campaign to accomplish these goals, even generating specific and alternative buys to hit your goals. Our optimizer analytics simultaneously calculates against budget, reach and frequency, all while staying within your defined buy parameters. Additionally, we score the impact of every ad unit against the overall campaign. This method allows us to show which spots perform for your goals, and which are wasted. WE'RE CONFIDENT WE CAN PLAN A BETTER BUY WITH LESS MONEY. conact us and we'll anayze your first campaign free.